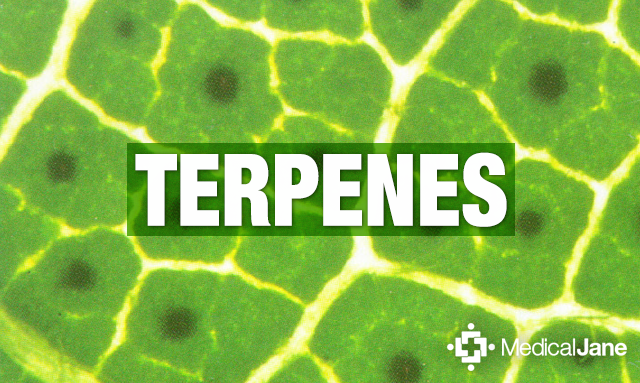 Terpenes: What Are Terpenoids And What Do They Do? The cannabis plant consists of a wide variety of chemicals and compounds. About 140 of these belong to a large class of aromatic organic hydrocarbons known as terpenes (pronounced tur-peens). You may have also heard people talk about terpenoids. The words terpene and terpenoid are increasingly used interchangeably, although these terms do have different meanings. The main difference between terpenes and terpenoids is that terpenes are hydrocarbons (meaning the only elements present are carbon and hydrogen); whereas, terpenoids have been denatured by oxidation (drying and curing the flowers) or chemically modified. Terpenes are synthesized in cannabis in secretory cells inside glandular trichomes, and production is increased with light exposure. These terpenes are mostly found in high concentrations in unfertilized female cannabis flowers prior to senescence (the condition or process of deterioration with age). The essential oil is extracted from the plant material by steam distillation or vaporization. Many terpenes vaporize around the same temperature as THC (which boils at about 157°C), but some terpenes are more volatile than others. Terpenes also play an incredibly important role by providing the plant with natural protection from bacteria and fungus, insects and other environmental stresses. It is well established that cannabis is capable of affecting the mind, emotions and behavior. The main psychotropic cannabinoid, delta-9-tetrahydrocannabinol (THC) has been intensely studied. However, many of the other cannabinoids, terpenoids and flavonoids found in medical marijuana that play a big role in boosting the therapeutic effect of cannabis remain understudied. Terpenes are common constituents of flavorings and fragrances. Terpenes, unlike cannabinoids, are responsible for the aroma of cannabis. The FDA and other agencies have generally recognized terpenes as “safe.” Terpenes act on receptors and neurotransmitters; they are prone to combine with or dissolve in lipids or fats; they act as serotonin uptake inhibitors (similar to antidepressants like Prozac); they enhance norepinephrine activity (similar to tricyclic antidepressants like Elavil); they increase dopamine activity; and they augment GABA (the “downer” neurotransmitter that counters glutamate, the “upper”). However, more specific research is needed for improved accuracy in describing and predicting how terpenes in cannabis can be used medicinally to help treat specific ailments / health conditions. The Carlini et al study demonstrated that there may be potentiation (a form of synaptic plasticity that is known to be important for learning and memory) of the effects of THC by other substances present in cannabis. The double-blind study found that cannabis with equal or higher levels of CBD and CBN to THC induced effects two to four times greater than expected from THC content alone. The effects of smoking twice as much of a THC-only strain were no different than that of the placebo. This suggestion was reinforced by a study done by Wilkinson et al to determine whether there is any advantage in using cannabis extracts compared with using isolated THC. A standardized cannabis extract of THC, CBD and CBN (SCE), another with pure THC, and also one with a THC-free extract (CBD) were tested on a mouse model of multiple sclerosis (MS) and a rat brain slice model of epilepsy. Scientists found that SCE inhibited spasticity in the MS model to a comparable level of THC alone, and caused a more rapid onset of muscle relaxation and a reduction in the time to maximum effect than the THC alone. The CBD caused no inhibition of spasticity. However, in the epilepsy model, SCE was a much more potent and again more rapidly-acting anticonvulsant than isolated THC; however, in this model, the CBD also exhibited anticonvulsant activity. CBD did not inhibit seizures, nor did it modulate the activity of THC in this model. Therefore, as far as some actions of cannabis were concerned (e.g. anti-spasticity), THC was the active constituent, which might be modified by the presence of other components. However, for other effects (e.g. anticonvulsant properties) THC, although active, might not be necessary for the observed effect. Above all, these results demonstrated that not all of the therapeutic actions of cannabis herb is due to the THC content. Dr. Ethan Russo further supports this theory with scientific evidence by demonstrating that non-cannabinoid plant components such as terpenes serve as inhibitors to THC’s intoxicating effects, thereby increasing THC’s therapeutic index. This “phytocannabinoid-terpenoid synergy,” as Russo calls it, increases the potential of cannabis-based medicinal extracts to treat pain, inflammation, fungal and bacterial infections, depression, anxiety, addiction, epilepsy and even cancer. Flavonoids are one of the largest nutrient families known to scientists, and include over 6,000 already-identified family members. About 20 of these compounds, including apigenin, quercetin, cannflavin A and cannflavin B (so far unique to cannabis), β-sitosterol, vitexin, isovitexin, kaempferol, luteolin and orientin have been identified in the cannabis plant. Flavonoids are known for their antioxidant and anti-inflammatory health benefits, as well as their contribution of vibrant color to the many of the foods we eat (the blue in blueberries or the red in raspberries). Some flavonoids extracted from the cannabis plant have been tested for pharmacological effects. The clinical findings are promising, but further research is needed to fully understand what role flavonoids play in the overall therapeutic effects of cannabis treatment, especially how they interact with cannabinoids by either synergistically enhancing them or reducing their effects. Terpenes have been found to be essential building blocks of complex plant hormones and molecules, pigments, sterols and even cannabinoids. Most notably, terpenes are responsible for the pleasant, or not so pleasant, aromas of cannabis and the physiological effects associated with them. Patients will often ask to smell the cannabis when selecting their medicine. The idea is that certain aromas help identify different strains and their effects. As the Casano et al study shows, medical marijuana strains can vary greatly from one source to another, and even from one harvest to another. Those with relatively high concentrations of specific terpenes do, however, make them easier to identify by their smell than other strains. Most agree that varieties that smell of musk or of clove deliver sedative, relaxing effects (high level of the terpene myrcene); piney smells help promote mental alertness and memory retention (high level of the terpene pinene); and lemony aromas are favored for general uplift in mood and attitude (high level of limonene). In a spectral analysis performed by Green House Seed Co., they were able to identify the terpenes in each of their strains, and developed a “flavor wheel” to help medical marijuana patients decide on their strain of choice based on the effects desired. Although one of the primary purposes of the wheel was to market different seeds for this particular company, the concept and vocabulary used is becoming an invaluable tool for medical marijuana patients, caregivers, and cultivators alike. Since then, several companies have developed their own terpene and weed wheels, albeit for the same reasons — to market their own products or services — and that’s OK. By mapping out terpene profiles, we are able to predict and even manipulate the effects and medicinal value of varieties, giving breeders endless opportunities for developing new, highly-desired cannabis strains by basing breeding decisions on real analytical data. The more we are able to communicate using the same language, the easier it is for everyone to understand clearly what medicine they are getting. Myrcene, specifically β-myrcene, is a monoterpene and the most common terpene produced by cannabis (some varieties contain up to 60% of the essential oil). Its aroma has been described as musky, earthy, herbal – akin to cloves. A high myrcene level in cannabis (usually above 0.5%) results in the well-known “couch-lock” effect of classic Indica strains. Myrcene is found in oil of hops, citrus fruits, bay leaves, eucalyptus, wild thyme, lemon grass and many other plants. Myrcene has some very special medicinal properties, including lowering the resistance across the blood to brain barrier, allowing itself and many other chemicals to cross the barrier easier and more quickly. In the case of cannabinoids (like THC), myrcene allows the effects of the cannabinoid to take effect more quickly. More uniquely still, myrcene has been shown to increase the maximum saturation level of the CB1 receptor, allowing for a greater maximum psychoactive effect. Myrcene is a potent analgesic, anti-inflammatory, antibiotic and antimutagenic. It blocks the action of cytochrome, aflatoxin B and other pro-mutagenic carcinogens. The Bonamin et al study focused on the role of β-myrcene in preventing peptic ulcer disease. The study revealed that β-myrcene acts as an inhibitor of gastric and duodenal ulcers, suggesting it may be helpful in preventing peptic ulcer disease. Its sedative and relaxing effects also make it ideal for the treatment of insomnia and pain. Since myrcene is normally found in essential oil from citrus fruit, many claim eating a fresh mango about 45 minutes before consuming cannabis will result in a faster onset of psycho activity and greater intensity. Be sure to choose a mango that is ripe otherwise the myrcene level will be too low to make a difference. Pinene is a bicyclic monoterpenoid. Akin to its name, pinene has distinctive aromas of pine and fir. There are two structural isomers of pinene found in nature: α-pinene and β-pinene. Both forms are important components of pine resin. α-pinene is the most widely encountered terpenoid in nature. Pinene is found in many other conifers, as well as in non-coniferous plants. It is found mostly in balsamic resin, pine woods and some citrus fruits. The two isomers of pinene constitute the main component of wood turpentine. Pinene is one of the principal monoterpenes that is important physiologically in both plants and animals. It tends to react with other chemicals, forming a variety of other terpenes (like limonene) and other compounds. Pinene is used in medicine as an anti-inflammatory, expectorant, bronchodilator and local antiseptic. α-pinene is a natural compound isolated from pine needle oil which has shown anti-cancer activity and has been used as an anti-cancer agent in Traditional Chinese Medicine for many years. It is also believed that the effects of THC may be lessened if mixed with pinene. Limonene is a monocyclic monoterpenoid and one of two major compounds formed from pinene. As the name suggests, varieties high in limonene have strong citrusy smells like oranges, lemons and limes. Strains high in limonene promote a general uplift in mood and attitude. This citrusy terpene is the major constituent in citrus fruit rinds, rosemary, juniper and peppermint, as well as in several pine needle oils. Limonene is highly absorbed by inhalation and quickly appears in the bloodstream. 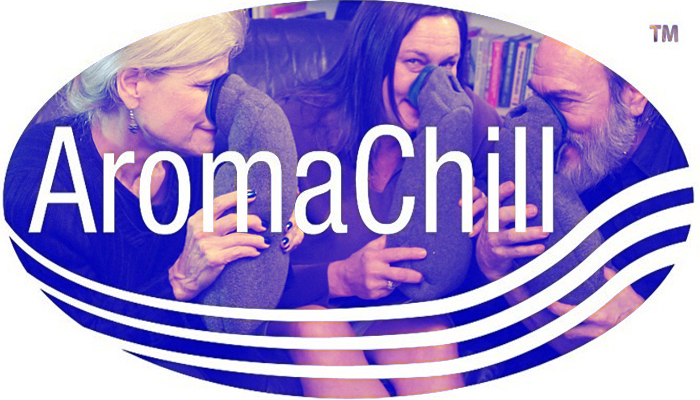 It assists in the absorption of other terpenes through the skin and other body tissue. It is well documented that limonene suppresses the growth of many species of fungi and bacteria, making it an ideal antifungal agent for ailments such as toenail fungus. Limonene may be beneficial in protecting against various cancers, and orally administered limonene is currently undergoing clinical trials in the treatment of breast cancer. Limonene has been found to even help promote weight-loss. Plants use limonene as a natural insecticide to ward off predators. Limonene was primarily used in food and perfumes until a couple of decades ago, when it became better known as the main active ingredient in citrus cleaner. It has very low toxicity and adverse effects are rarely associated with it. Beta-caryophyllene is a sesquiterpene found in many plants such as Thai basils, cloves, cinnamon leaves and black pepper, and in minor quantities in lavender. It’s aroma has been described as peppery, woody and/or spicy. Caryophyllene is the only terpene known to interact with the endocannabinoid system (CB2). Studies show β–caryophyllene holds promise in cancer treatment plans. Research shows shows that β–caryophyllene selectively binds to the CB2 receptor and that it is a functional CB2 agonist. Further, β–caryophyllene was identified as a functional non-psychoactive CB2 receptor ligand in foodstuff and as a macrocyclic anti-inflammatory cannabinoid in cannabis. The Fine/Rosenfeld pain study demonstrates that other phytocannabinoids in combination, especially cannabidiol (CBD) and β-caryophyllene, delivered by the oral route appear to be promising candidates for the treatment of chronic pain due to their high safety and low adverse effects profiles. The Horváth et al study suggests β-caryophyllene, through a CB2 receptor dependent pathway, may be an excellent therapeutic agent to prevent nephrotoxicity (poisonous effect on the kidneys) caused by anti-cancer chemotherapy drugs such as cisplatin. The Jeena, Liju et al study investigated the chemical composition of essential oil isolated from black pepper, of which caryophyllene is a main constituent, and studied its pharmacological properties. Black pepper oil was found to possess antioxidant, anti-inflammatory and antinociceptive properties. This suggests that high-caryophyllene strains may be useful in treating a number of medical issues such as arthritis and neuropathy pain. Beta-caryophyllene is used especially in chewing gum when combined with other spicy mixtures or citrus flavorings. Linalool is a non-cyclic monoterpenoid and has been described as having floral and lavender undertones. Varieties high in linalool promote calming, relaxing effects. Linalool has been used for centuries as a sleep aid. Linalool lessens the anxious emotions provoked by pure THC, thus making it helpful in the treatment of both psychosis and anxiety. Studies also suggest that linalool boosts the immune system; can significantly reduce lung inflammation; and can restore cognitive and emotional function (making it useful in the treatment of Alzheimer’s disease). Linalool boosts the immune system as it directly activates immune cells through specific receptors and/or pathways. The Sabogal-Guáqueta et al study suggests linalool may reverse the histopathological (the microscopic examination of biological tissues to observe the appearance of diseased cells and tissues in very fine detail) hallmarks of Alzheimer’s Disease and could restore cognitive and emotional functions via an anti-inflammatory effect. The Environmental Protection Agency has approved its use as a pesticide, flavor agent and scent. It is used in a wide variety of bath and body products and is commonly listed under ingredients for these products as beta linalool, linalyl alcohol, linaloyl oxide, p-linalool and alloocimenol. Its vapors have been shown to be an effective insecticide against fruit flies, fleas and cockroaches. Linalool has been isolated in several hundred different plants. The Lamiaceae plant and herb family, which includes mints and other scented herbs, are common sources. The Lauraceae plant family, which includes laurels, cinnamon, and rosewood, is also a readily available source. The Rutaceae family, which contains citrus plants, is another viable source. Birch trees and several different plant species that are found in tropical and boreal climate zones also produce linalool. Although technically not plants, some fungi produce linalool, as well. Linalool is a critical precursor in the formation of Vitamin E.
Terpinolene is a common component of sage and rosemary and is found in the oil derived from Monterey cypress. Its largest use in the United States is in soaps and perfumes. It is also a great insect repellent. Terpinolene is known to have a piney aroma with slight herbal and floral nuances. It tends to have a sweet flavor reminiscent of citrus fruits like oranges and lemons. Terpinolene has been found to be a central nervous system depressant used to induce drowsiness or sleep or to reduce psychological excitement or anxiety. Further, terpinolene was found to markedly reduce the protein expression of AKT1 in K562 cells and inhibited cell proliferation involved in a variety of human cancers. Camphene, a plant-derived monoterpene, emits pungent odors of damp woodlands and fir needles. Camphene may play a critical role in cardiovascular disease. The Vallianou et al study found camphene reduces plasma cholesterol and triglycerides in hyperlipidemic rats. Given the importance that the control of hyperlipidemia plays in heart disease, the results of this study provide insight into to how camphene might be used as an alternative to pharmaceutical lipid lowering agents which are proven to cause intestinal problems, liver damage and muscle inflammation. This finding alone warrants further investigation. Camphene is a minor component of many essential oils such as turpentine, camphor oil, citronella oil and ginger oil. It is used as a food additive for flavoring, and also used in the preparation of fragrances. It is produced industrially by catalytic isomerization of the more common α-pinene. α-Terpineol, terpinen-4-ol, and 4-terpineol are three closely related monoterpenoids. The aroma of terpineol has been compared to lilacs and flower blossoms. Terpineol is often found in cannabis varieties that have high pinene levels, which unfortunately mask the fragrant aromas of terpineol. Terpineol, specifically α-terpineol, is known to have calming, relaxing effects. It also exhibits antibiotic, AChe inhibitor and antioxidant antimalarial properties. Phellandrene is described as pepperminty, with a slight scent of citrus. Phellandrene is believed to have special medicinal values. It has been used in Traditional Chinese Medicine to treat digestive disorders. It is one of the main compounds in turmeric leaf oil, which is used to prevent and treat systemic fungal infections. 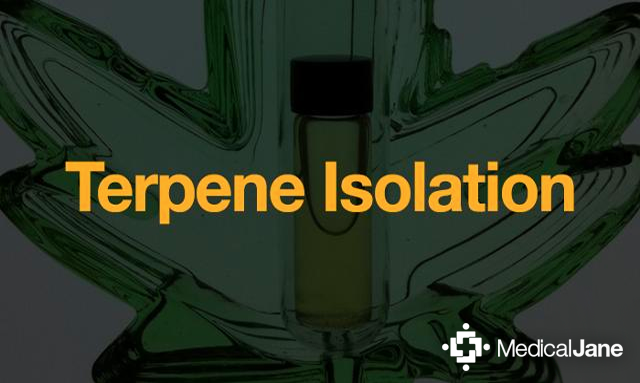 Phellandrene is perhaps the easiest terpene to identify in the lab. When a solution of phellandrene in a solvent (or an oil containing phellandrene) is treated with a concentrated solution of sodium nitrate and then with a few drops of glacial acetic acid, very large crystals of phellandrene nitrate speedily form. Phellandrene was first discovered in eucalyptus oil. It wasn’t until the early 1900s that it was actually constituted and shown that phellandrene from eucalyptus oil contained two isomeric phellandrene (usually referred to as α-phellandrene and β-phellandrene), and on oxidation with potassium permanganate gave distinct acids, concluding that the acids had been derived from two different isomeric phellandrene. Before that, phellandrene was mistaken for pinene or limonene. Today, we are aware of many essential oils where phellandrene is present. It is, however, a somewhat uncertain terpene as it can only be detected in the oils of some species, especially in Eucalypts, at particular times of the year. Phellandrene can be found in a number of herbs and spices, including cinnamon, garlic, dill, ginger and parsley. A number of plants produce β-phellandrene as a constituent of their essential oils, including lavender and grand fir. The recognizable odors of some essential oils depend almost entirely upon the presence of phellandrene. Oil of pepper and dill oil are composed almost entirely of phellandrene. The principal constituent in oil of ginger is phellandrene. Phellandrene, particularly α-phellandrene, is absorbed through the skin, making it attractive for use in perfumes. It is also used as a flavoring for food products. Delta-3-carene is a bicyclic monoterpene with a sweet, pungent odor. It is found naturally in many healthy, beneficial essential oils, including cypress oil, juniper berry oil and fir needle essential oils. In higher concentrations, delta-3-carene can be a central nervous system depressant. It is often used to dry out excess body fluids, such as tears, mucus, and sweat. It is nontoxic, but may cause irritation when inhaled. Perhaps high concentrations of delta-3-carene in some strains may be partially responsible for symptoms of coughing, itchy throat and eye afflictions when smoking cannabis. Delta-3-carene is also naturally present in pine extract, bell pepper, basil oil, grapefruit and orange juices, citrus peel oils from fruits like lemons, limes, mandarins, tangerines, oranges and kumquats. Carene is a major component of turpentine and is used as a flavoring in many products. Humulene is a sesquiterpene also known as α-humulene and α–caryophyllene; an isomer of β–caryophyllene. Humulene is found in hops, cannabis sativa strains, and Vietnamese coriander, among other naturally occurring substances. Humulene is what gives beer its distinct ‘hoppy’ aroma. Humulene is considered to be anti-tumor, anti-bacterial, anti-inflammatory, and anorectic (suppresses appetite). It has commonly been blended with β–caryophyllene and used as a major remedy for inflammation. Humulene has been used for generations in Chinese medicine. It aids in weight loss by acting as an appetite suppressant. Pulegone, a monocyclic monoterpenoid, is a minor component of cannabis. Higher concentrations of pulegone are found in rosemary. Rosemary breaks down acetylcholine in the brain, allowing nerve cells to communicate more effectively with one another. An ethnopharmacology study indicates pulegone may have significant sedative and fever-reducing properties. It may also alleviate the side effects of short-term memory loss sometimes associated with higher levels of THC. Pulegone has a pleasant peppermint aroma and is considered to be a strong insecticide. Sabinene is a bicyclic monoterpene whose aromas are reminiscent of the holidays (pines, oranges, spices). Results of an ongoing study by Valente et al suggest that sabinene should be explored further as a natural source of new antioxidant and anti-inflammatory drugs for the development of food supplements, nutraceuticals or plant-based medicines. Sabinene occurs in many plants, including Norway spruce, black pepper, basil and Myristica fragrans (an evergreen indigenous to the Moluccas)—the Spice Islands of Indonesia. The seeds of the Myristica fragrans are the world’s main source of nutmeg. Sabinene exists as (+)- and (–)-enantiomers. Geraniol produces a sweet, delightful smell similar to roses. This makes geraniol a popular choice for many bath and body products. It is also known to be an effective mosquito repellant. Medically, geraniol shows promise in the treatment of neuropathy. What is the difference between terpenes and terpenoids? How many terpenes are in cannabis? Why does one strain of cannabis smell different than another? What is the difference between Kush and OG? Why do some marijuana strains give me “couch-lock”? My marijuana plants smell bad – are they OK? How do I use my nose to identify Indica cannabis strains? At what temperature do terpenes vaporize? Terpenes Influence the Synergy Effect of Cannabis As we know, science has identified and characterized the molecular structure of around 20,000 terpenes, which makes it the largest category of plant chemicals. These aromatic compounds are found in the essential oils of plants and flowers, and plenty of studies have been done on their effects. Of the 20,000 identified terpenes, about 140 of these have been found in cannabis. Only a few of them appear in high concentrations, but they have been found to have a number of benefits. There are 31 references in this page. Click here to view them all. Vito Mediavilla and Simon Steinemann (1997). Essential oil of Cannabis sativa L. strains,. Journal of the International Hemp Association 4(2): 80 - 82. Gerritsen, M. E., Carley, W. W., Ranges, G. E., Shen, C. P., Phan, S. A., Ligon, G. F., & Perry, C. A. (1995). Flavonoids inhibit cytokine-induced endothelial cell adhesion protein gene expression. The American Journal of Pathology, 147(2), 278–292.